Satisfaction of our customers are our prime motive keeping this in mind we offer fancy ladies Black Designer Ladies Jellabiya in various colors, prints and fascinating designs. These are easy to wear and comfortable full length garments, widely demanded in the global markets. These Stylish Ladies Caftan are manufactured from best quality material. Our firm specializes in manufacturing, exporting, retailing and supplying a comprehensive range of Kaftan. These are designed using superior quality fabric and sophisticated technology in compliance with the international standards. Our Blue Designer Ladies Kaftan are more in demand in market because of its unique quality. We are customer focused manufacturer and supplier of kaftan. Well-stitched Embroidered Kaftan is our specialty. 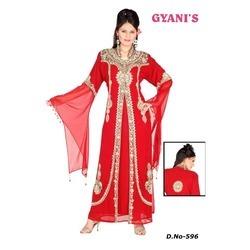 We are one of the most prominent Exporters of Ladies Kaftan in domestic as well as overseas market. We are the prominent and customer focused manufacturer, exporter and supplier of Woman Kaftan. We are engaged in offering a wide and mesmerizing range of Women Kaftan that are made with high precisions by our experts designers and tailors. These are available in various colors and designs that include proper finishing and are comfortable to ware. Our fabric used is well appreciated in the market and we make sure that we maintain this reputation. Clients can avail these kaftans for the nearest markets at the leading competitive prices. Size As demanded by client. We believe in quality of our products, so that our customers can avail quality product. Our organization is widely acclaimed in the market for our innovative range of Silk Chiffon Kaftan that are made with the best fabric that are procured from some of the best vendors in the industry. These are available in different sizes and also designed as per the specifications of the clients.